There are compelling reasons for India to join – and preserve – the Non-Proliferation Treaty. This is not the first time that the NPT has faced such a crisis. In fact, as others have pointed out, the crises provided a necessary stimulus to streamline and strengthen the regime. For instance, the Nuclear Suppliers Group (NSG) was established as a result of India’s first nuclear test in 1974. Similarly, revelations of Iraq’s hidden nuclear program led to a further tightening of the regime and introduction of the Additional Protocol. Following the North Korean withdrawal from the NPT, there have been suggestions for removing the right to withdrawal clause, although this is yet to be accepted. The NPT’s troubles go beyond the failed RevCon. Despite the deal, Iran remains a major challenge to the NPT. It must also be noted that the deal was being negotiated outside the NPT framework, signaling the ineffectiveness of the NPT in the face of such challenges. Iran and North Korea are symptomatic of a larger malaise that ails the non-proliferation regime – the lack of consensus that has come to hamper the process of strengthening the regime. 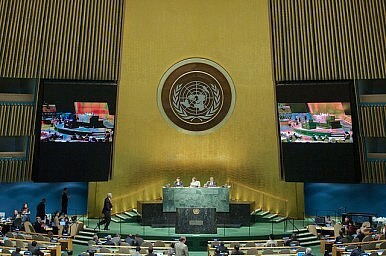 In the past, despite many other disputes, the major powers were willing to work together in harmonizing their viewpoints on the NPT and find solutions. This is clearly lacking in today’s environment. Today, even while all major powers recognize and acknowledge many of the challenges, they appear unable to build consensus on solutions. This is of course not unique to nuclear non-proliferation issues but that does not make it any less significant. On any global crisis today, there appears to be two camps, one led by Russia and China and the second by the Western bloc led by the U.S. Under President Barack Obama, the U.S. has had a particular preference for multilateralism and this has contributed to a lack of decisiveness on important issues such as non-proliferation. This dilution of American decisiveness and the resultant crisis in reaching consensus on global platforms has led to certain states exploiting the loopholes and weaknesses to their advantage. India’s role in curbing proliferation and strengthening the non-proliferation regime is generally seen to have been minimal because it remains outside the NPT. But this perception is not entirely valid: despite being outside the NPT, New Delhi has honored the central commitments and principles enshrined in the treaty, which is, first, not to transfer potential nuclear weapon technologies to countries that do not have them and second, to work assiduously towards nuclear disarmament. India was not being altruistic: it has a clear interest in preventing further nuclear proliferation. Yet for India to be able to effectively contribute to non-proliferation, it has to be inside the tent. The fact that India did not engage in transferring the nuclear know-how or technology to other countries – despite opportunity to do so – is a testament to this interest. India might be criticized for acquiring nuclear weapons, but New Delhi cannot be faulted for further proliferation – a track record that facilitated the implementation of the India-U.S. nuclear deal and ultimately the passage of the India-specific waiver on nuclear commerce at the NSG. Given India’s track record as a responsible nuclear power and the fact that it is a rising power with advanced technologies, it should be in the interests of the global nuclear community to bring India into the nuclear tent. Similarly, India should be seeking to join the regime and drive transformations that are comprehensive and in its national interests. Even as the NPT confronts serious challenges and drawbacks, it is a measure that must be strengthened. There are a number of reasons for this. The most important is that it is the only comprehensive instrument for addressing global non-proliferation challenges, while preserving the right of NPT-member states to pursue civil nuclear energy. Even as three states with nuclear weapons remain outside, the near-universality of the NPT is remarkable. The fact that it has managed to stem horizontal proliferation to the extent it has is testimony to the success of the NPT. While little has been achieved on the nuclear disarmament front, NPT members continue to work on the issue. In the recent years, certain NNWS have taken up initiatives outside the NPT framework; for instance, the Humanitarian Impact of Nuclear Weapons, which seek to ban nuclear weapons. However, they continue to engage the NWS within the NPT framework in taking these initiatives forward. Equally importantly, devising an alternative to the NPT is likely to be a futile exercise, given the challenges of bringing together almost the entire international community on this issue for another treaty. Also, given the growing geopolitical divide among major powers today, conceptualizing and creating such an arrangement remains a remote possibility. In addition, proliferation of nuclear technologies and know-how among a large number of states has made writing new rules of the road extremely challenging. Moreover, the dangers of these technologies falling into the hands of non-state actors, including terrorist networks, make it a compelling force for major powers to come together in strengthening the existing regimes, including the NPT. Lastly, the changing balance of power equations and the relative decline of U.S. power suggest that Washington may not be in an effective position to shape a new narrative that is in the interests of the larger global community. All this makes it imperative for the global community to take appropriate steps to ensure the primacy of the NPT and other existing non-proliferation arrangements. India, too, has an interest in preserving the NPT regime, because although a new arrangement to replace the NPT may include India as a member, the very real possibility that a new arrangement might not come to fruition is too great a risk to contemplate. Better the known NPT devil than nothing at all. Therefore, it is in India’s interest to make every effort in getting accommodated in the existing regimes, so that it can effectively contribute to the global non-proliferation cause. Dr. Rajeswari Pillai Rajagopalan is a Senior Fellow at the Observer Research Foundation. She served at the National Security Council Secretariat, Government of India from 2003 to 2007. Arka Biswas is a Junior Fellow at the Observer Research Foundation.